1 of 5 In bowl, mix flour, salt. In medium bowl, beat together butter and sugar on medium speed until fluffy, 2 minutes. Beat in egg and vanilla. On low speed, beat in flour mixture in thirds. Shape into disk; divide in half. Wrap and refrigerate 1 hour or overnight. 3 of 5 Using half the dough at a time, roll out between waxed paper to 3/16-inch thickness. Remove top sheet; cut out stars, squares and circles of various sizes. Cut out star shapes in center of some. Reserve scraps. Place cookies on waxed paper in freezer for 5 minutes. Transfer cookies from waxed paper to ungreased baking sheets. 4 of 5 Bake in 350 degree F oven 11 to 13 minutes or until lightly browned around edges. Transfer to rack; cool. Repeat steps with scraps. 5 of 5 Prepare Royal Icing. 1 of 1 Paint some cookies with thin icing, using thin spatula to spread to edges. (If decorating some stars with white candy nonpareils, sprinkle on immediately.) Let set. Pipe thick icing on some cookies in dots, swirls, lines and plaids. 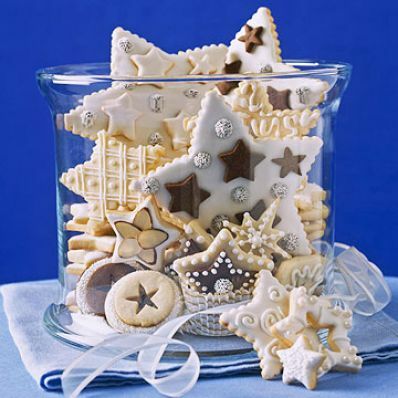 Attach smaller vanilla and chocolate star cookies and nonpareil-covered chocolate dots to larger cookies with dollops of thick icing; press together gently. Attach almonds in same way. Let dry.